The JRSO’s (Junior Road Safety Officers) have been extremely busy throughout the year, working hard and learning how to stay safe on the road. 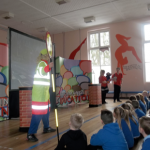 Unfortunately they didn’t make it through to the Swansea semi-finals of the annual Road Safety Quiz this year, but their assembly for both Key stages to highlight Road Safety was fantastic! They have represented the school to the best of their ability and have made every effort to raise awareness of Road Safety within the school throughout the year. A sterling effort by our team! They have set competitions; liaised with ‘Kerbcraft’ and worked really hard to teach the school how important it is to stay safe on the roads. We also had a fabulous visit from a ‘Road safety’ workshop arranged by the Road Safety department in County. 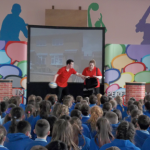 It was a show full of music, dancing, singing and more importantly an important message of how to stay safe on the roads, whether your walking, cycling or in a car.